Are you tired of living in the city? The pollution and the noise is everywhere. Yet are you looking for a peaceful and eco-friendly place that would make you feel relaxed and calm? Well you are invited to see this Lakeside Retreat House for you to feel the serenity of the place. This is the reason why Peter Gluck and his co-architects showcase the Lakeside Retreat house for you to witness the secret of what makes this house exceptional and astonishing from the others. Also he claims that initiating an experience rather than constructing a clearly distinct object should be an architect’s supreme goal. 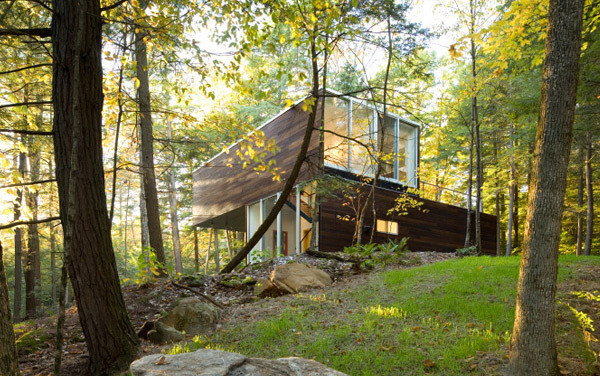 With that, he successfully completed the Lakeside Retreat in Adirondack Mountains situated in New York. 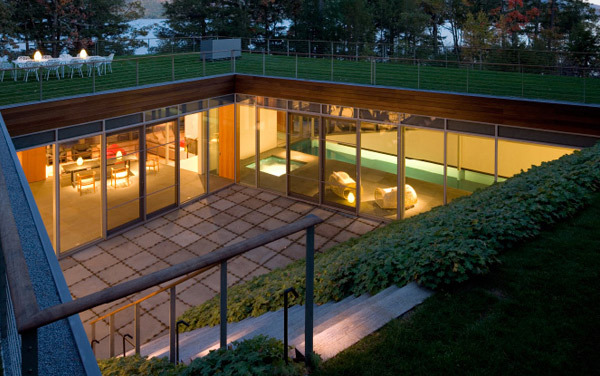 He proved that the lakeside house can be set in the earth with 21, 700 square feet of residential space for living and leisure purposes. 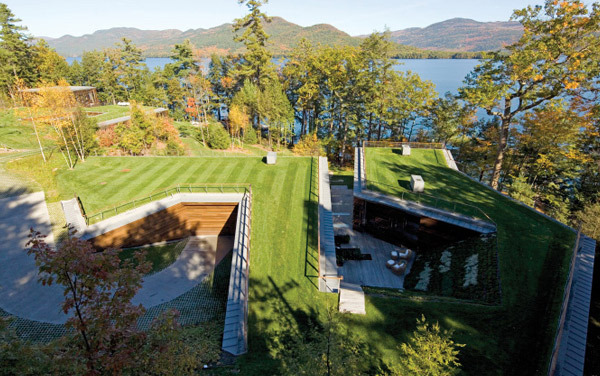 The two buried buildings, that is, the family house and a recreational building is designed with an amphitheater, a gallery, an indoor pool and an interior courtyard. 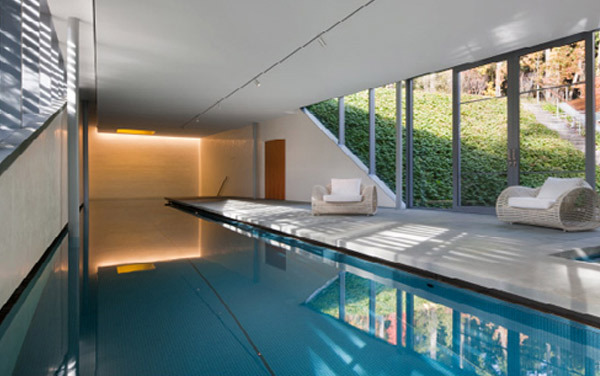 The said indoor pool has indispensable parts on a 21-acre site slope. Aside from the mentioned features above, why don’t we explore the magnificent look of the Lakeside Retreat? The area is bounded by many trees that comfortably adds beauty and serenity to the house in the middle of nature. The serenity of the place captivates the heart of those who takes a glimpse of the home’s aerial view. The comfy bedroom perfectly complements the design, concept and style of the house. The coolest blue water in the swimming pool exquisitely flows here. The sun’s rays straightly pass through the window as it provides natural light to the stillness of the water in the swimming pool. An underground recreational area designed to have both cooling and heating effect. The dim light found in the recreational area brings out the design of the house. A splendid aerial view of the place showing the green trees and the sea water. 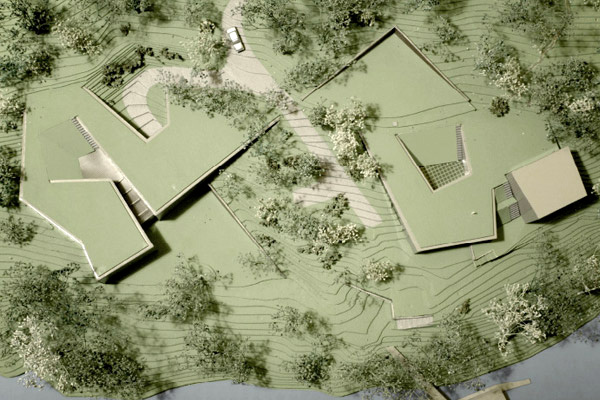 The Lakeside Retreat plan demonstrated in three dimensional views. 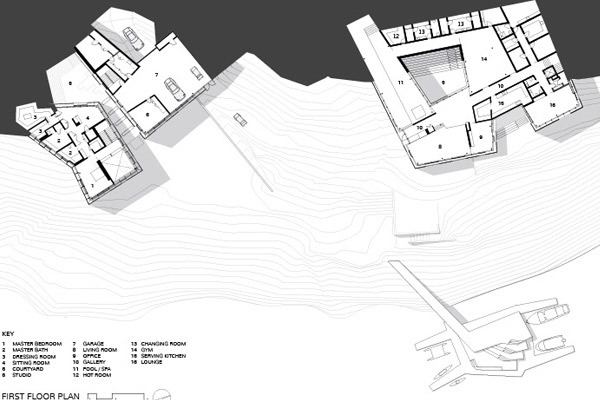 Lakeside Retreat’s architectural plan shows the different areas of the house. 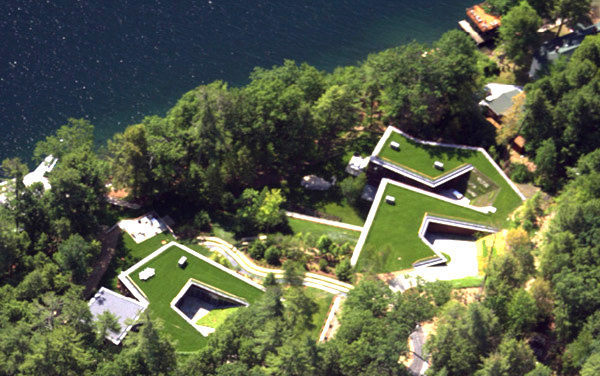 The Lakeside Retreat of Peter Gluck and his partners was successfully designed and it is believed that this is a work of art with a skillful touch of nature. It welcomes visitors who wanted to unwind from the pressure and stressful job in the city. The eco-friendly and traditional beauty that has been upgraded proves itself that it can captivate the people’s heart because of its design and location. The Lakeside Retreat has already achieved its objective to make use of the materials and the scenery to compete in other modern recreational houses in the globe.